Agriculture in Africa south of the Sahara is at a prospective tipping point. Growth has accelerated in the past decade, but is unsustainable given increasing use of finite resources. 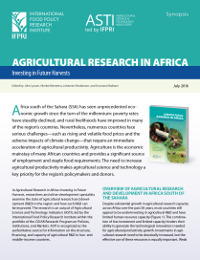 Agricultural Research in Africa: Investing in Future Harvests discusses the need to shift to a growth path based on increased productivity—essential if Africa is to increase rural incomes and compete in both domestic and international markets. Such a shift ultimately requires building on evolving improvements that collectively translate to deepening rural innovation capacity. An essential component of innovation is a continuous supply of improved agricultural technologies and management practices stemming from an effective and efficient agricultural research system. The basic architecture of such a system is essentially in place, but it has yet to coalesce into a fully integrated system with clear divisions of labor and effective subsidiarity. Increasing national agricultural research investment remains a critical prerequisite for achieving balanced agricultural growth in Africa.